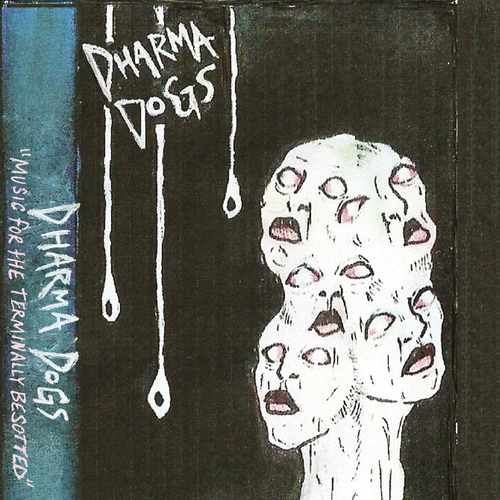 Dharma Dogs pin their fuzz-rock hearts on their sleeves with their almost earnest anthology of EP works with the full length Music For The Terminally Besotted, released September 29th through ourselves digitally and on a limited cassette tape run. Serendipity played a key role in the union between the label and band – fostered by a love of professional wrestling back in the earlier 2000’s, singer/guitarist Chris Joutras and label founder Benjii Jackson somehow crossed digital paths years later and fortuitously discovered both were involved in each other’s respective music scenes; Chris being in a number of acts based in Madison, Wisconsin and Benjii… well… pouring money into releasing music. Recorded by Bobby Hussy (of The Hussy) across the space of a year, it’s a release that nearly didn’t see the light of day with a hesitation from the band that perhaps it was a little late with ongoing projects taking place around Wisconsin in the interim. Thankfully, after a bit of coaxing to come into the digital era, Dharma Dogs release could become a seminal piece of work from a very encouraging music scene emerging out of the Midwest.